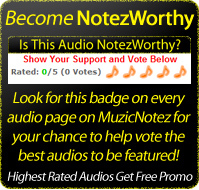 MuzicNotez has re-vamped our rating system to more effectively rate and then showcase our best new music to come out. We have changed how it looks, how it works and what you receive when you're on the top of our indie charts (Notezworthy Charts). We have opened up polling to all of the public, not just MuzicNotez members. So now it is easier for you to promote your content and invite your fans to vote for you. It is also easier for the rest of the public not just your friends and fans to vote on all content to keep all the ratings more honest and accurate, so it's not just a popularity contest it truly rates the best new music there is. Once a month, the highest rated audios, videos, artists and bands will be showcased throughout our site on our highest traffic pages. Articles will be personally written up by the MuzicNotez Crew reviewing and promoting this highly rated content. The Emerging Talent Agency will also be reviewing this content and if they like what they hear will also be contacting you with an opportunity for further promotion.